Baseball-Fun One on One with a minimum of baseball equipment and no baseball diamond, then it is only baseball by you, but with one man gamesmanship with perfect practice. You my Lad will now upon applying the tenets of perfect practice habits have the makings of a baseball playing Legend. All you need to bring to the table of practice is the burning desire to improve your capabilities. Fashion in your mind the thoughts of you performing at an All-Star game as you develop your habits and skills which become second nature and virtual routine action and reaction. You are going to do this all by your lonesome and after all is said and done the boy playing his game alone becomes the All-Star player on his team in the near future. You are in beginner baseball paradise when you have that strong "want to" and enjoy baseball-fun one on one. After all is said and done this perfect practice all by your lonesome is where baseball player greatness begins. When young players get the right training and do "perfect practice," they can beat out someone else that is genetically gifted but doesn't necessarily get proper training and is not deligent in his practice habits. Why? The gifted player may be doing things improperly. Being genetically gifted doesn't mean you will always be the best player! It is an absolute must to study and ask coaches to show and demontrate the best mechanics in performance of the skills. When you practice you want to practice what is called "perfect practice" to develop your skills so that they are a natural routine execution of these best mechanics of performance. Want to know the secret of the players who make the big show? They not only were endowed with a huge gift and more than ample "Want To" but they applied themsilves to many wonderful hours of baseball-fun one on one all alone. More than just their natural skills, their knowledge of the fundamental mechanics of "How To" has also played an important role in their game. You must, learn to walk the walk before you talk the talk. Learn the fundamental skills first, refine them as you get better. Baseball fun one on one as you do "perfect practice" gets the job done. Baseball fun one on one is a vital necessity for any youngster and especially those living in the rural areas where the nearest neighborhood kid is quite a distance away. Coach! what is one to do? Son you must simply make do. To be that complete baseball player and athlete becoming someones hero you need to develop your skill in every phase of your game of baseball-fun. You need to become athletically fit, proficient and above all consistent in performing the baseball skills of (1)Pitching, (2)Fielding, and (3)Hitting. If we in fact conquer any or all these skills at a recognizable consistent high level everyone will sit up and take notice. All of this is possible all by your lonely baseball-fun one on one. It has to be perfect practice and we do this with make shift practice baseball equipment and use of country boy ingenuity. For the puposes of this session we forego the many aspects we dwell upon in much further detail within our other topics such as hitting and position playing How To Skills. Many other details will follow after baseball-fun one on one has been mastered. Some common products are needed to set-up for your pitching baseball practice fun one on one spot where you will diligently practice to perfect your pitching abilities all alone. A.Find a Big Oak tree close to your home if not in your yard then have Grand-dad or Dad to talk with a neighbor who has such a tree. Make sure it is cleared with your neighbor for the use of his tree. B. Hang the tire with the rope from a good strong limb of the tree. The bottom center of the inside rim of the tire should be off the ground approximately 17" to 20". Now this inside of the tire represents our strike zone we shall use for perfect practice of pitching. C. On the back side of the tire between the tree and the tire hang an approximate 10' by 10' piece of the Tarp. This tarp acts as the backstop to keep from chasing downtown for the thrown balls. You might want to add a 2x2 or 2x4 10' wood stiffener board at the top edge of the tarp to keep the tarp spread and making your backdrop tarp little more stablelized. Make sure your tarp touches the ground so that no balls skip under and keep going all the way into the honeysuckle patch or where the black berries grow. D. Pace off and actually measure the correct distance to place your pitching rubber from the front edge of the tire. Remember the home plate back point is 17" behind the front edge of your tire. Little League official distance is exactly 46' from front edge of the pitching rubber to the back point of home plate. The imaginary back point of our home plate is 17" centered and to the rear of the front edge of the tire. Substrating the 17" measure 44' 7" from front edge of the tire to the front edge of your pitchers rubber. Teenagers and high schoolers this distance moves back to the 60'and 6" mark front of the picthing rubber to the back of home plate. E. Scurry around the neighborhood and find a good used five gallon bucket to use as your baseball keeper. A painting contractor will be glad to save and give you a good 5 gallon bucket. F. Visit ballparks near your home and talk ball team managers out of some used baseballs or visit yard sales and flea markets and bargain for used baseballs. You will need a five gallon bucket filled with baseballs to do some diligent pitching practice. As you pitch and empty the bucket now go gather up the baseballs and start all over again. G.Baseball glove,always practice with your glove on, for the glove adds balance and without the glove your balance seems a little awkward plus you need to form the natural habit of hiding the ball in your glove. H. Wear your spikes during your practice sessions to get habited to making the correct pivot and placement of your foot in contact with the pitching rubber. Additionally the follow through placement of your pitching stride needs to become totally accustomed to how the natural feel of using spikes effects your balance and follow through of your pitching motions. You now know what is needed to get started on this perfect pitching baseball-fun practice all alone one on one. Baseball-fun one on one play it again Sam ….again and again and feel your skills improve! Note: Warm up completely before you begin and remember to common sense your number of pitches when you are throwing full speed! Pitch an inning of balls n’ strikes and keep score (you can do this against another player too but when alone…compete against yourself). Assume nobody can hit your fastball, so it's either in the strike zone or it's not. See how many pitches it takes you to strike out the side (3 outs) – Pitch as many innings as you do in your league play, but let's take care of our arms…right? Variations can include marking the lower half of the strike zone (where most hitters struggle) so now a strike is only those pitches. Your chest will swell with pride as you make that ball dance right into the strike zone pitch after pitch now you tell is baseball-fun One on One? Here’s another great one…every time you throw 2 fastball strikes in a row you must follow it with your 2nd pitch, preferably a change-up. And one more…when you get 2 strikes with your fastball, throw one off-speed (hopefully a change-up for younger players) in the dirt at home plate (simulates making a hitter chase a bad one)…then fire another fastball right down the gut. Remember, your primary job as a pitcher is to start the hitter's bat…but a swinging strike out is another skill you must practice…and a lot of bseball-fun too! Do you get it? Do you see how much fun you can have by simply competing with yourself? This is great stuff I did as a kid and now your turn for baseball-fun one on one and on your own. Trust me when I tell you that no matter how good you are or even think you are, getting better allows you to keep playing. Every pro player, many which you may never have heard of, was somebody’s star athlete…it takes more than your present skills! So, Who Wants To Power Their Game To The Next Level? Remember that every minute of every day that you are NOT improving at anything you REALLY want to become good at…somebody else is out there doing it. Now go have some fun! Baseball-fun really gets exciting with every ounce and bounce of improvement as your skills develop keener and keener it is hard to wait till next time. The essential items needed to set up for our fielding baseball-fun are very few the biggest thing is to find our wall or other suitable item to throw against. A. there on the home place grounds locate a good solid wall to toss against. Be mindful that it is cleared with Dad and Mom as to what you will be throwing your tennis ball against in order to field the rebounds. After finding that good solid background to throw your rebounding tennis ball against you are set to go. First right off the bat, my younger brother Bailey reminded me of how he used his baseball-fun one on one growing up and developing his skills and love of the game. May we share it with you? Bailey said:,"Baseball-fun one on one" is great for its value to any youngster or even a seasoned player who wants to maintain a training program without the assistance of another player to increase his skill level. 1. I would take a tennis ball and throw it against the brick wall of the school lunch room adjacent to our home. It helped in developing my skills in the fielding of all types of returning balls just as if they would be coming from the opposing players bat. With my control of throwing speed and location I could field returning balls of all types and description. i.e. fast ground balls, slow ground balls, line drives, pop ups and the like. With the proper accuracy of my throws I could make the ball go to the right or left of me to hone up my skills moving in different directions. Also, I could make the ball return above head level that also increased my skills to go after and retrieve the difficult hit balls. 2. Secondly, I would go to the open area between our home and Grandmother Liles home and throw rocket balls at 90 degrees (straight up) till the baseball looked like a BB. I developed my skills in fly catches (overhead and basket catches). My favorite catch was the "behind the back catch" which I developed to a "fine art". While it was impractical on the actual field of play it sure was fun and a real confidence builder. Just a little "hot dogging" with the "behind the back catch". If any thing added to this real life explanation could be folly for it tells so much of the story of what baseball practice fun one on one for developing fielding skills is all about. One more bit of information to make your solo one on one baseball-fun on the fielding skills part of our game. Keep a mental note of how many rebounding happy bouncing balls you in fact might field cleanly no bobbles. Always make a mental note start your count over after each bobbled chance. Never leave your practice session until you have truly fielded 10 opportunities consecutively with no errors. Quitting when you field 10 chances without error is not the object the object is that when you have tired of pratice and are ready to leave is when the ten (10) consecutive chances free of miscues apply. Do not leave until you have consecutively fielded 10 cleanly, handling it clean as a whistle, no bobbles allowed. Do it till it is only natural to look that ball into your glove and field a significant high percent of chances cleanly. No one will need to tell you what is a good percentage for that is for you and you alone to know and feel your very own satisfaction right? Hitting baseball-fun here is the real bread and butter of becoming a baseball hitting player. What do you think you would really need for practice and making hitting a baseball-fun one on one? No Sir-ree no store bought baseball bat is needed. Here is the list of items recommended to do your perfect practice for baseball-fun as told by this once Cotton Top youngster from Alabama. A. broom stick handle when Moms old broom is pretty well worn out ask her if you can have it to make yourself a hitting stick. Cut the broom handle at about a four foot length. B. peebles if your yard does not have an ample supply then do not be disheartened for here is what to do. You have that five gallon bucket you use for pitching practice now we have another need for it. Go down to the creek and wade out into the bend of the creek where the water flows rippling over some of the downcreek shoals and makes a sharp turn. Over near the far bank is a build up of smaller sized gravel. Scoop up gravels by the double hand fulls and put your hands under the flowing current and wash away the silt and very small pebbles from your hand. Now by these clean washed double hand full of pebbles fill that bucket and struggle toting it back home. Now you have ample supply of good hitting pebbles. C. buy a bag of marbles and now we will shoot marbles till the cows come home. As you get really good shooting marbles by shooting one marble and hitting the others scattered on the ground you will see and feel a miracle unfold. D. get your Dad or Grand-dad to make you a swell shooting slingshot. Better yet get your Mom to buy you a store bought slingshot from the hardware or toy store.Then to you might talk dad into shopping right here from many of your on line merchants offered here at baseballfarming. E. a Daisy Red Ryder BB gun with a big box of BB's will fix you up just fine for all you will need for some good Hitting skills development. Young man or little lady in pigtails armed with the items above you have all you will need to develop the most important aspect of making yourself a superb cracker jack Hitter. 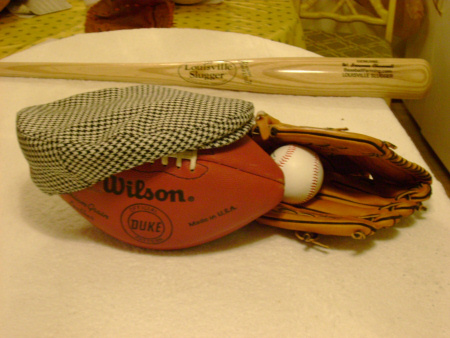 The above items as companion props you will be able to develop the most critical and most basic and fundamental real art of hitting a baseball. What you haven't even given me a Ball nor a Bat and you are talking hitting baseball-fun. Here is the --"sole key"-- for ever being a great baseball hitter. First you must be a master of Focused Concentration with superb Eye and Hand Coordination. Use of the above items as baseball fun one on one you will surprise even yourself and your Mom your Dad all of your brothers sisters cousins Aunts and Uncles will be so proud they will almost burst with pride. All of that solitude time out there tossing pebbles into the air and slapping them into the trees with that broom stick, make believe bat, will start to be as natural as tying your laces of your sneakers. Down on one knee shooting marbles, using your favorite marble as a "toy, or is it toe" you will soon realize hey this is easy as pie. It was not easy at the beginning but now it is a cake walk I can hit the other marbles every shot. Slinghot shooting and knocking tin cans off the fence post maybe I should go shake the post to get it to tumble down. Discouragement and giving up is not what we started out to accomplish. Keep on trying and I will bet you a quarter to the hole in a doughnut you will start hitting the can. You see it is baseball-fun which gets the job done. Ping right on target and old tin can hopped off the post. sit it back up and try it some more. Soon it becomes ping ping and ping right and left the cans fall. Told you you could do it! Be safe where you point your BB gun for a little BB will do significant damage when hitting the wrong object. Alway think about safety first with any gun OK. Shooting from a short reasonable distance shooting the can sitting on the post like a Post Turtle will be right easy. As you gain confidence and practiced agility of shooting now we start shooting from the hip not aiming by using the sights of the BB gun. Eureka you are still able to hit the can and as it rolls along the ground you just keep on hitting it shot after shot as it rolls and hops with every shot. In Summary the hitting lessons and skill gained? Buster or Sis after using all the items and endless hours of all alone One on One you have taught yourself that baseball fun is great. What you have taught yourself is the most important part of ever being a great baseball hitter you have gained Eye and Hand Coordination to a level that could take you to unknown heights as a baseball hitter. Practice well Practice long and practice till all is perfect but always make it something you enjoy as a challenge to improve and make it baseball-fun. Grand-dad or Dad or an Uncle will give you some fine tuned pointers to help your practice be perfect practice. Do more than have baseball-fun enjoy your ability to have some website building funjust like baseball-fun telling the world about something which is important and fun for you and others. Go Shopping Online Here Now From Baseballfarming Save Money Making Baseball-Fun.